Very Good. 068483569X ALL BOOKS SHIPPED WITHIN 1 DAY OF PURCHASE! Good. Yellow pages. Ships from UK in 48 hours or less (usually same day). Your purchase helps support the African Children's Educational Trust (A-CET). Ex-library, so some stamps and wear, and may have sticker on cover, but in good overall condition. 100% money back guarantee. We are a world class secondhand bookstore based in Hertfordshire, United Kingdom and specialize in high quality textbooks across an enormous variety of subjects. We aim to provide a vast range of textbooks, rare and collectible books at a great price. Through our work with A-CET we have helped give hundreds of young people in Africa the vital chance to get an education. We provide a 100% money back guarantee and are dedicated to providing our customers with the highest standards of service in the bookselling industry. Very Good. The bestselling business classic from Pulitzer Prize-winning author Daniel Yergin, which puts into context the global effect of privitisation. Trade paperback (US). Glued binding. 512 p. Contains: Illustrations. Good. 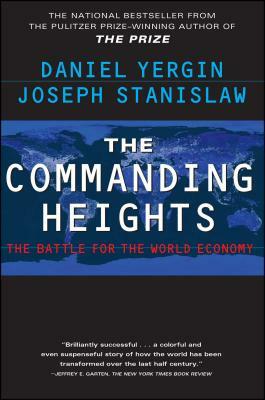 The bestselling business classic from Pulitzer Prize-winning author Daniel Yergin, which puts into context the global effect of privitisation. Trade paperback (US). Glued binding. 512 p. Contains: Illustrations. Excellent book and great quality. Great experience.